INTRODUCTION: "Most of the time the Moontide Bridge lies deep below the sea, but every 12 years the tides sink and the bridge is revealed, its gates open for trade. The Magi are hell-bent on ruling this new world, and for the last two Moontides they have led armies across the bridge on 'crusades' of conquest. Now the third Moontide is almost here and, this time, the people of the East are ready for a fight ... but it is three seemingly ordinary people that will decide the fate of the world"
Intriguing blurb, great sample so a novel that became a must read on publication, Mage's Blood is David Hair's first foray into adult fantasy. ANALYSIS: (Liviu) The setup of the series is as follows: the world of Urte where the irregular orbit of the Moon creates huge tidal differences on a 12 year cycle while making sea navigation all but impossible outside locally coastal; for many centuries, the two main continents in which the action takes place, Yuros and Antiopia/Ahmedhassa have been in complete ignorance one from another despite being separated only by 300 miles of water while developing a Western like civilization in Yuros and Islamic (Ahm) and Indian (Lakh) - like cultures in Ahmedhassa. However some 500 years before the start of the novel in 927, magic - gnosis - comes to the West when the 1000 followers of a hippie-like prophet, Corineus, are touched by supernatural power in a terrible and unforgettable night. Some few hundred die, including Corineus, some few hundred are unchanged, but some few hundred become extremely powerful magicians called Ascendants whose gnosis gets transmitted linearly by blood - child of mage and non-mage gets 1/2 power and so it goes up to 1/16 mage blood which is lowest where gnosis manifests - with the caveat that mage with mage couples have very few children overall so "pure bloods" remain relatively rare, while mixed bloods abound. The original Ascendants split into factions - a militant one that forms a mighty empire in Yuros that rules to the present day and a peaceful one led by Antonin Meiros that retreats to the ends of Yuros in Pontus and sets up Ordo Costruo dedicated to improving the lives of people by magic; among other things, gnosis allows magical flying machines to work, so Anthiopia is discovered by air some 300 years ago and limited trade and visitations occur. He seemed perfectly aware of it last time I saw him, reflected Gyle. He wondered whether Lucia Fasterius truly believed the bigoted dogma she spoke. She seemed intelligent, learned – kindly, even. But in her eyes something fanatic lurked, like a venomous snake. Lucia came to a halt behind her chair and gripped the wooden back tightly. ‘For a century we have seen the Bridge open every twelve years, when the tides drop to levels that permit traverse. We have seen the merchants pour across then return with all manner of addictive Eastern goods – opium and hashish, coffee and tea, even the silks and other luxuries that entrance our people. They can virtually name their prices on return. The bankers extend credit to merchants whilst squeezing the nobility, the magi-protectors who made Rondelmar what it is. Who are the richest men in Rondelmar? The merchants and bankers! Fat obsequious slime like Jean Benoit and his merchant cabal. And what have they bought with their ill-gotten gains? Our homes – our belongings – our art, and worse: they have purchased our sons and daughters, our Blood!’ Lucia was shouting now, spittle flecking her lips. ‘Those scum are buying our children and taking them to wife or husband, so that their misbegotten offspring will have everything, both gold and gnosis, and as a result, we are seeing a new breed, the mage-merchant, nasty, grasping half-breeds." The main characters of the novel are: Elena Anborn, Norosian half-blood mage and former feared guerrilla fighter in the revolt under the (in)famous Gurvon Gyle who appears in the quote above as an intimate of the ruling Empress Mater as he was pardoned years after the revolt on condition to do the Empire's dirty work from then on. Ostensibly working as bodyguard for the Nesti ruling family of Javon which is an Antiopian kingdom partly settled from Yuros during the peaceful era and is unique in the normal - though tense of course - cohabitation of the two races, Elena is actually under Gyle's orders and unfortunately for everyone living there, Javon is very important strategically for both sides, the Yuros Empire, and the Ahm Sultan and Lakh Emperor, respectively. Kazim Makani, Ramita's fiancee, son of an Amteh warrior who became blood-brother with Ispal in Hebusalim during the terrible 904 - as in our history, Lakh is ruled by an Amteh emperor with the majority locals coexisting uneasily with the Amteh invaders and converts. When Ramita is taken away, Kazim goes berserk and later joins the shihad but of course things are not quite as they seem. The time of trials for all is approaching! Mage's Blood has great action and memorable characters; the portrayal of the cultures and their clash is extremely well done with nuanced characters, good and bad guys and girls on both side. On the negative side I had two structural issues: the world itself or at least the known continents to date are just a shrunken version of Europe and Asia and that makes it feel a little like a small sandbox rather than a real world. Then the cultures described have been in isolation one from another for untold centuries before the gnosis and the airships when the appearance of magic in the world allowed the West to get to the East so to speak - that would be a third flaw in a way, why not do it the other way, with the East getting the magic and getting to the West first - and I just cannot believe the unitary nature of the cultures as despite surface differences there is a fundamental similarity between the Western, Islamic and Indian cultures in our world and in the world of the novel. This of course is not surprising in our world considering how they interacted and influenced each other forever so to speak (compare to the pre-Columbian Maya, Inca, Mexica or even the North American Native cultures and see what I mean), but it stretches somewhat the suspension of disbelief in the novel. 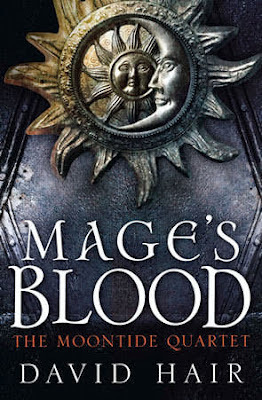 With a very good ending with a TBC sign but no real cliffhangers, while having revelations and big promises for the next volume, Mage's Blood is a gripping read with lots of twists and intriguing characters so I am in for the duration. (Mihir) I hadn’t heard of David Hair before I found out about this one. Since it was a release from Jo Fletcher books, I was interested in it purely based on the blurb details as well as the recent excellent and diverse releases Jo Fletcher books had so far. This book had a blurb that promised a war that occurs every twelve years due to a specific tidal event and featured a world that bears a close resemblance to certain areas and historical aspects of our own. The story focuses on various nations on the continents of Yuros and Antiopia/Ahmedhassa. Yuros is the western landmass hosting various nations that have a magical aspect to their theology and chief among the nations are the Rondians who form the empire to rule over the entire continent. Antiopia or Ahemedhassa is the eastern continent that’s connected to its western half by means of a geographical bridge that was constructed by a mage. The eastern continent has many nations which bear a striking similarity to certain middle Eastern cultures as well a region that is culturally, theologically and geographically very very similar to the Indian subcontinent. The story focuses on various characters strewn across these dual continents and many nations. Ranging from long lived mages/witches to young girls to aspiring mages and many more, the POV characters come from varied cultures and backgrounds to give the reader a panoramic view into the world developed by the author. Justin from Staffer’s Musing’s blog had compared it to the Prince of Nothing trilogy but one that was more accessible to readers. This is a very astute observation; I would modify it to a certain extent and say that the author has tried to present a clash of civilizations, this time occurring literally between east and the west while also shining a close light on some of the cultures existing in the Indian subcontinent as well as the Middle East. This series sets up a conflict that has been years in the making and will occur at a great cost to both sides but before it can begin, the political machinations have already been initiated. Beginning with the ascension rites across various regions to the beatification of an empress, there is a lot that happens in the first 150-200 pages. The reader might be definitely be bamboozled by the various POV characters, side character cast as well the different plot threads being introduced. There are a few maps present in the start and they will be extremely handy in tracking the various locales mentioned and details occurring in them. I frequently referred to them as the action went from place to place and they were very helpful. The character cast is a vast one and it can be confusing sometimes plus there are no character appendices provided so it was very cumbersome to keep track of who’s who and related to whom and located where. The story is set on a timescale leading up to the complete recession of the moon tide that leads the story on a very twisted landscape and slowly the readers realize as to what all is truly happening. The end two hundred pages are choc-a-bloc with action, political intrigue, character treachery and much more happening on a grand stage. The author has showcased a world that’s violent, dark and as possibly as ambiguous as ours. There are no truly clear-cut characters as most of them have shades of good or bad but the good ones do end up doing things that aren’t entirely befitting their natures and the evil ones do things that cannot be construed as completely evil. Of course there are a couple of ones that are just plain old evil/megalomaniacal and they provide impetus to the political & magical twists to the main plot. This book has the best parts of the epic fantasy genre and adding to that also has a conflict that promises to be epic but is also grounded in moral ambiguity that is prevalent so much in the current geo-political scenarios of our world. There’s also the multivariate character cast that will keep the readers occupied with their antics and actions that enthrall and keep the readers hooked on to their chapters. The author has managed to bring about a mirror to the complex and fascinating historical conflicts that occurred during the middle ages and gives it a drastic mystical kick to stir up a hornet’s nest. This is the first volume in a tremendously exciting series and one, which I’ll be following with great interest in the next few years. I have this on my reading list and close to the top since the premise is quite interesting for me. It is a huge volume and I can't say that I have much free time nowadays, but I definitely need to check "Mage's Blood". First time commenting, your review has sold me on this book. I will give a go. It is really important to create a world that is "familiar but different" when world building. Worlds that are not familiar and relatable are harder to get into. To create this Hair changes the names of many familiar items, words, and phrases in his world to make his world different from ours. Most authors do this but Hair takes it farther then most. This makes the first few chapters a little difficult to read. Just power through them, take notes if you have to, it's worth it, the last 2/3rds of the book fly by. Great read looking forward to other works by Hair in the future. The first chapter was a very good read,so I bought the book.When i got home and started on the following chapters I wanted to hang myself for spending the money on this TRASH. Don't Don't Don't buy it. Actually this is one of the books that rewards keeping going - or just fast reading/skipping 100-150 pages - as after a while it gets really good and stays with you for a long time. However I agree that it takes a while to get going.